Usually held on a Sunday (or Sundays) in November at Bowlerama in Stoney Creek. Depending on numbers, all sections may bowl at the same time or the junior sections bowl on one day and the senior sections and adults on another day. Trophies may be awarded. Each section has the opportunity to build and race a vehicle. Beaver Scouts build (with parental assistance) Beaver Buggies; Cub Scouts build (with parental supervision) Kub Kars and the senior sections build "Big Rigs". These vehicles are then raced on special tracks. In early spring (usually February) the Area holds races for each section. Trophies are awarded for the fastest vehicle, the best design, etc. The area event is followed shortly thereafter by a Battlefields Council event. Up to ten youth from each section can be eligible to attend (maximum 2 youth from each section/group). Usually held in January. A half day of fun and competitive activities in the (hopefully) snow. This event is open to Cub Scouts as well. Usually held at Camp Wetaskiwin in April. Beaver Scouts come together on Saturday for a day of fun activities, meals and a campfire. They sleep over and continue with more fun on Sunday. Cuboree is held the last weekend of May at Camp Wetaskiwin. 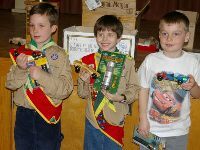 Each year there is a different theme for which Cub Scouts are encouraged to wear a suitable costuime. Activities are based around the theme. Held in late spring, Scouts compete to prepare and bake the best bannock. Other activities specific to Scouts are usually organized in a less formal fashion. Activities specific to Venturer Scouts are usually organized in a less formal fashion. More information will appear on the Home Page. Other activities specific to Rover Scouts are usually organized in a less formal fashion. Since Rover Scouts are actually young adults and are usually fewer in number, most activities are council or region wide. Please check the Battlefields site for more information about this training. Held at Blue Springs and Blue Heron(near Acton). 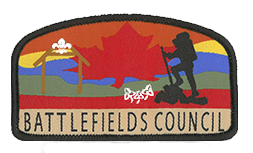 The last full weekend of September is for Cub Scouts, while Scouts and Venturer Scouts meet in the spring. All take part in activities that help prepare them to earn the World Environment Award. Beaver Scouts and Cub Scouts take part in a day and evening of activities learning about the environment and what they can do to protect it. Held at Blue Heron. A day's activity in the snow followed by, what else, pancakes. Blue Heron. For senior Beaver Scouts about to move up to Cub Scouts. Blue Heron. If you can't make it to Fruitbelt's JOTT, or you just like to hike a lot, join other Scouts at Blue Springs/Blue Heron. *Blue Springs sponsors even more activities, so be sure to check out the Blue Springs site. 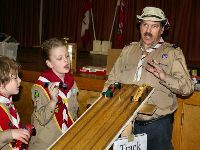 Scouters are encouraged to include as many of the Area activities as possible in their programs. These activities are intended to enhance each section's program and to encourage communication and socialization between groups. *For more information about these activities, please vist the Blue Springs web site.